Very relaxed, bohemian hostel. 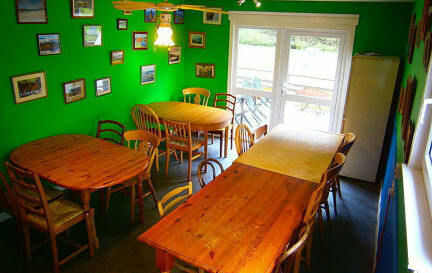 Good self-catering kitchen and nice mixture of families and students..
Een lekker informele plek om te blijven. Eten koken en gezellig een spelletje spelen of in alle rust een boek lezen was goed mogelijk. Locatie is was verder dan gewenst, maar wel met tankstation/bus/winkel in de buurt. Rijden naar de top van Skye kost je +-30min extra, maar gelukkig is er ook veel mogelijk in het onderste gedeelte van Skye. Wifi was snel genoeg om te browsen naar routes/bezienswaardigheden. Grootste nadeel was het ontbreken van een drying room, maar verder was alles voldoende! Nice place to stay! Beautiful old house with nice view from the living room. Friendly staff and fine kitchen. The rules about cleaning the kitchen are clear and everybody acts near it, which is nice to experience. Sanitair can use an upgrade, but everything is clean. It was fine for one night, but the atmosphere wasn't great and the kitchen is old. Staff:++ Beds:++ Showers:++ Rooms:++ Kitchen:+ Heating: not existing. 12 degrees outside is OK but not inside. I strongly suggest to get a fireplace. The male personel was really nice. The room small but okay. The showers are okay (some locks are broken). The kitchen is old and not clean, it needs an upgrade. The thing I disliked the most was the atmosphere. We were in the common room having a good time, laughing talking.. when they asked to be more quiet (it was 9 pm, the rules say quiet after 11). We still made 2 much noise app when a woman came and scolded us, threatened there wont be a 3rd time! Change the rules if it must be quiet at 9! My rating is so low because it is the middle of November and there is no heating in the building! I really think this is one of the basic necessities. Thank god there was a little electric heater in the room. I think the location is good if you have a car or are planning to hick to another town, but if you're planning on neither of those things there isn't much to do in the area. I rented a car and put in layers of clothing, which made everything better. First of all: broadford is very isolated if you are planning to tour the island. It is nearly impossible to achieve without a car. The people around are pretty friendly. The hostel itself was not very clean. Especially the showers. 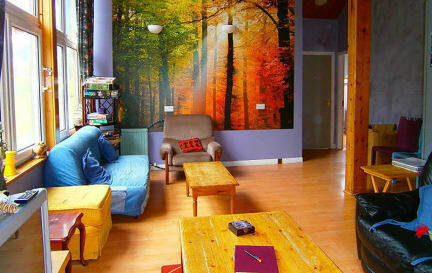 There was one good thing about the hostel and that was the livingroom. A beautiful room with very big windows, a big screen tv and a lot of dvds in their collection.